I thought I could resist making a comic about the discovery of so many errors in a standardized test in the nearby community. But I could not. I’m resisting the urge to create a comic about it. Resisting …. What I wonder is how many students caught the errors and then wondered if the errors were part of the test? Maybe one error might make you think, that was a mistake. But 100 errors? That becomes like some Jedi mind trick, don’t you think? And who are the “district proofreaders” and what were they doing when they should have been reading the test? Sometimes, in novels, I stumble across an error and it always makes me stop and wonder about the editorial process, and the layers of proofreading that go on (we went through it with our Teaching the New Writing collection) and still, that one erroneous werd finds its way in there like a worm in the ear. PS — Yes, werd was intentional. I hope you caught it. If so, give the Springfield schools a call. They may be searching for some folks. I am in the midst of planning out our Webcomic Camp for middle school students. The camp takes place next week at our local vocational school and there are about 15 young comic artist/writers signed up. My colleague, Tom, and I ran the camp for the first time last year and it was quite interesting. Like last year, we will mix in the use of traditional paper and pen for making comics along with using a few webcomic sites: Make Beliefs Comix, Bitstrips for Schools and ToonDooSpaces. We also have invited a few visitors who are local folks who work in the field of comics and graphic novels, and I am hopeful they can come in to work with our students. The camp runs for four days, for four hours each day, so there are some limits to what we can do. But I am going to use elements of Barbara Slate’s You Can Do a Graphic Novel as a place to develop some lessons for the camp kids. (Listen to the podcast interviews I did with Barbara earlier this year at The Graphic Classroom). Essentially, I want the camp kids to create a character they believe in and can develop, and then use that character in a series of activities throughout the week as they work on traditional comics and then, a longer graphic story format. Last year, we did not have an end product in mind but this year, I am trying to come up with something they have to complete as a comic showcase. I am trying to envision the backwards design principle here. Comic Camp Art Gallery from Mr. Hodgson on Vimeo. On the New Literacies Ning, Ian asked folks to add their own cool tools they have used or that they recommend for others to consider using, and I thought I might compile those recommendations here. It’s great to gather collective resources together. I’m continuing to process what I learned from the week at the Massachusetts New Literacies Institute. I am coming at this reflection from a teacher-leader perspective, knowing that we have three follow-up sessions with the 100-plus teachers over the next year, and our friends Don Leu, Hiller Spires and others have moved on from Massachusetts to likely work with others. And, if the state funds it, we may do a second week with all new teachers next summer. In other words, this movement here in Massachusetts that we started this week is now in our hands. And just like students, these teachers were able to push beyond their safe zone with technology and dive into the unknown. Our hope is that momentum carries into the school year and back at the distance. We want ripples to happen. I’ve been slowly savoring Mo Willems’ You Can Never Find a Rickshaw When It Monsoons for a few months now. This book — with its subtitle: The World On One Cartoon A Day — is a collection of one-page comics and illustrations that Willems did when he went on a low-budget backpacking tour of the world, starting in the United States and then heading out to Europe, Asia and more. The tour began before Willems was a published author of crazy kids’ books (the Pigeon books and more) and before he was married, so he was a single man on an adventure with his pen and paper. Unlike most tourist guides, Willems’ illustrated insights capture the daily color of life (shining through Willems’ own sense of humor) and what makes the book special is that Willems went back to his drawings and added short narratives of his memories of the scenes. Or his faulty memories. Or, in some cases, he admits he doesn’t even remember drawing the scene. The use of comic illustrations is another lens into culture, I realized, and I think I learned as much about Nepal and Paris and China as I have from any other book that I have read. Give Willems’ book a try. You won’t be disappointed. The Massachusetts New Literacies Initiative week is over, but I surely hope the real work has not yet begun — that of our teachers bringing ideas back to their school districts and emerging as leaders around technology integration. Here is my reflective voicethread that has some final thoughts at the end (It’s been a day-to-day threaded journal). My intention is to showcase some of the projects in the next week, just to give you an idea of some of the work that was being done. 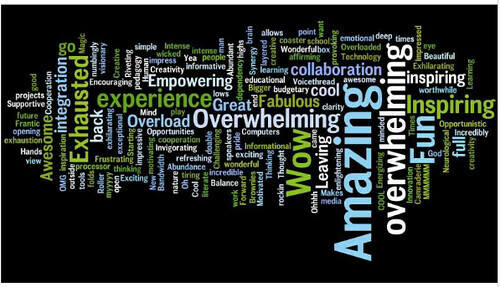 And here is a Wordle that we created of words and phrases that came to mind about their week at the Institute. I can’t help but notice that “overwhelming” and “amazing” are high on the list. I added another page to my reflective VoiceThread this morning as we begin to wrap up our time at the Massachusetts New Literacies Institute. Yesterday, our keynote speaker was Dr. Bridget Dalton, who talked about reaching diverse (ie, struggling) learners with technology, and a guest visitor was our state Education Commissioner Mitchell Chester. Here, I continue my Voicethread reflections at the Massachusetts New Literacies Institute. Yesterday, the featured speaker was Dr. Yong Zhao, who spoke of global competencies in the digital age and railed against the move towards nationalized education. He stressed the need for creativity over testing. Yes! Meanwhile, in one of the sessions yesterday around multimedia composition, we were put into small groups, given a Flip video camera and told to make a movie in 20 minutes on a topic. My group’s topic was the United States’ Intervention in North and South Korea. We decided to be creative (Dr. Zhao would have been happy) and make a bagel puppet show. I’m not sure we got all the nuances right (ahem) …. but it was fun. I continue to use my Voicethread as a reflective tool for the New Literacies Institute going on this week here in Massachusetts. I keep adding a “page” to the thread. Yesterday, we had the great pleasure of listening to and working with Dr. Sara Kadjer, who was insightful about the world of digital literacies and the classroom. She is on leave from her college post in order to get back into the classroom. Very inspiring insights!